READ NOW: Dozier’s story and 99 others from the past week who have been dramatically affected by sequestration. As the sequester fades from the headlines and gets reduce to a mere budgetary issues, many families and individual are feeling the effects of the automatic spending cuts. The new studies are downsizing the actual problems facing this country as agencies figure out ways to avoid the more alarming effects of the $85 billion in cuts, while Congress has given up on any solution to end the sequester. The sequester was portrayed by many even our nation’s leaders to bring the country to its knees yet we go on as normally as possible. The grips of the financial crisis are now beginning to be felt and the effects are quite dramatic already with organizations and companies laying off workers and many deciding not to hire for vacant spots. The food pantries that many families rely on are closed and many health services have followed suit. Farmers are forced to go without milk production information causing alarm in the dairy industry as higher milk prices are a possibility. Workers at missile testing fields are facing job losses, federal courts are force to be closed on Fridays and public broadcasting transmitters have been shut down. On a national level, sequestration has caused the cancellation of White House tours and long lines at the airport that never happened yet at the local level has begun to sting. 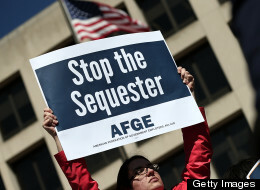 The Huff Post did an extensive review of the sequestration stories from the past week and found hundreds of stories across the country that took only a few hours to find and left no one immune from the cuts. Some mentions are rural towns in Alaska, missile test sites in the Marshall Islands, military bases in Virginia, university towns across the country, and housing agencies in inner cities are all feeling the cuts. Cathy Hoskins, executive director of Salt Lake Community Action Program that just closed a food pantry in Murray, Utah, commented: “Absolutely we’re feeling the effects of it. And our employees are trying to absorb the biggest parts of the cuts by taking furloughs and having the agency contribution to their retirement plan suspended.” Michael Jenkins, communications director of the Southeast Alaskan Regional Health Consortium, is also feeling the cuts as his group has to close the Bill Brady Healing Center that provides alcohol and drug treatment to Native Alaskans. Lashell Dozier, the executive director of the Sacramento Housing and Redevelopment Agency, had this to say about the effects of the sequester: “We are trying not to lay any employees off, but we will have reduced work schedules. We will also close our offices. there will be days when it is closed every month or several times a month. But if we do not come up with some type of solution or remedy by July, it will equate to 1,700 families losing housing vouchers, which is over 4,800 actual tenants.” The organization is facing $13.9 million cuts this year. Many officials are now grappling with the same issues and are using budget trickery as well as operational dexterity to avoid the pain, but the sequester is a real concern as the people and communities they serve rely on their help. The cuts started on March 1 after Democrats and republicans could not reach a decision to address the national deficits causing the sequestration to hit at a time when poverty in the U.S. is climbing while the nation tries to recover from an economic downturn not seen since the Great Depression of the 1930s. The U.S. Census Bureau puts the numbers of American Poverty at levels not seen since President Johnson launched the War on Poverty according to the Associated Press. Currently as of January, nearly 50 million Americans which is one in six are living below the poverty line according to the bureau and 20 percent of the country’s children are poor. Under the spending cuts, Baltimore Housing Commissioner Paul T. Grazino believes his agency will have a $25 million shortfall in funds to help the poor with housing while 35,000 people are on a waiting list. Not only that, the city struggles to deal with city clean up efforts as Baltimore has 15,000 vacant and abandoned structures because of population decline over the past fifty years. While the economy tries to recover, improvements for those in deep poverty cannot keep pace with the cuts as the spending reductions hit hardest Americans not directly tied to the economy such as Head Start pre-school programs. Some worry though that the gap between rich and poor will keep widening under the austerity measures. According to the non-paritsan Congressional Research Service last year, “U.S. income distribution appears to be among the most unequal of all major industrialized countries and the United States appears to be among the nations experiencing the greatest increases in measures of income.” Marry O’ Donnell, director of community services at Cathloic Charitirs of Balitmore, has already seen an increase in income inequality during the U.S. downturn stating, “In the last three years, there’s been a great change in the kinds of people we are serving. There are increasing numbers of people who owned a home, lost their jobs, end up living in their car and are coming with children to our soup kitchen,” she said. Her organization spent $126 million the last year feeding the poor, helping the unemployed find employment and housing, running nursing homes, and helping people get on their feet. About $98 million of that money came from various programs funded by the city, state, and federal government as these programs now face cuts because politician failed to do their job in Washington and find a compromise.